Sri Radha is the Ashraya Vigraha; she is the abode of love. Krishna is the Vishaya Vigraha; he is the object of love. And we all are little Ashraya Vigrahas. This is Vrindavan! Sri Radha is Vrindavaneshwari. She is the presiding queen of Vrindavan. Her love is the energy that pervades everything and everyone. Even the plants, even the trees, the river, the kunds, the insects, the bees – buzz – the cuckoos, the birds, the peacocks, the cows, the calves, the buffalos, the goats – everyone in Vrindavan is simply immersed in that energy of Sri Radha’s love. Everyone is an instrument of her love. And therefore, everyone is conquering Krishna and Krishna is conquering everyone. We read so many stories of how Krishna conquered Kamsa and he conquered Jarasandha and he conquered Shalva and he conquered so many. He is great in Vrindavan; he conquered Putana and Agha and all of these people. But his real happiness was when he was conquered by the love of his devotees. When Yashodamayi would tie him up and he would cry, when Radharani would not talk to him and he would cry and beg for her attention and for her affection, when the gopas would wrestle with him and they would defeat him in wrestling, this is where Krishna gets his greatest pleasure – to be conquered by the love of a devotee. And the devotee’s greatest pleasure is to be conquered by the love of Krishna. That is the yoga of love that is within all of us. By chanting Krishna’s names, by associating with those who love Krishna, then that fog – that fog of illusion – is cleared by the sun of this grace, and then we see who we really are. And we awaken to experience that love; we experience Krishna; we experience the whole creation as Krishna’s world; and we experience every living being as Krishna’s beloved. This the Gita tells as the perfection of yoga, the yoga of love within all of us. 17 Responses to "The Yoga of Love"
An absolute and delightful explaination about love given by swamji here! Thanks for making it so comprehensible! Very true. Thanks Radhanath Swami. Vaishnavas live in Vrindavan and if not create Vrindavan atmosphere around. This is an excellent explanation on chanting giving all the benefits. Great. 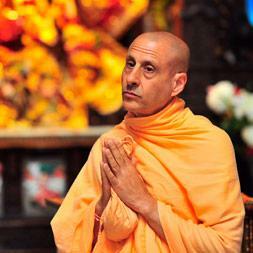 Radhanath Swami doesn’t impose his views. He explains with genuine concern and is full of compassion. No wonder he is accepted by one and all. Wonderful explanation of love. Today people are fighting for positions and try to defeat their opponents by any means. Even husband and wife are also fighting just to satisfy their false ego. Here HH Radhanath Swami has explained how a supreme personality of Godhead love to be defeated by his cow heard friends. It is really out of our out of intellectual understanding that a supreme Lord who conquers all his enemies just by a glance of his eyes is bound by his loving mother Yasodamai. Supreme controller becomes a charioter for his friend Arjuna in Kurukhetra war. We can learn that real happiness is to be an instrument in hands of Radharani to give pleasure to Krishna. 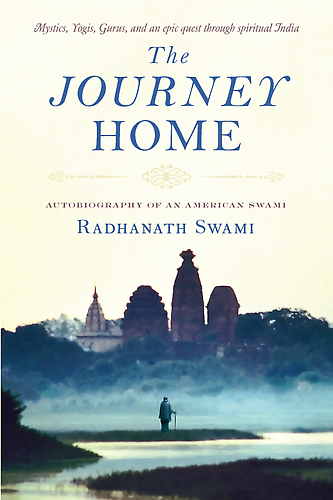 Its amazing to see the daily life at Vrindavan through the eyes of Radhanath Swami. Krishna is the supreme but becomes totally humble in Vrindavan. Radharani is the queen of Vrindavan. All of this shows the power of true love..
Well said. Radhanath Swami explained nicely how the Supreme Lord wants to be conquered by the love of His devotees. Wonderful article by HH Radhanath Swami Maharaj. Superb article, Thank you HH Radhanath Swami for the nectar. Wonderful article that describes love so well! Well said. Lord wants to serve His devotees and His devotees want to serve the Lord. Thanks Radhanath Swami. Amazing words of Maharaj. This is the real meaning of Yoga and not the postures that we generally know of.